The special thing of wooden chess piece is we can paint it any colors. Interesting to vermilion red King chess piece? We had make it for you. The wooden chess piece is carved by our expert craftsman, which use the best quality of Teak wood that has dried. It finished with beautiful polish in vermilion red color, add glossy touch so that it looks so elegant. Color chess is unique and beautiful also for decoration house use. 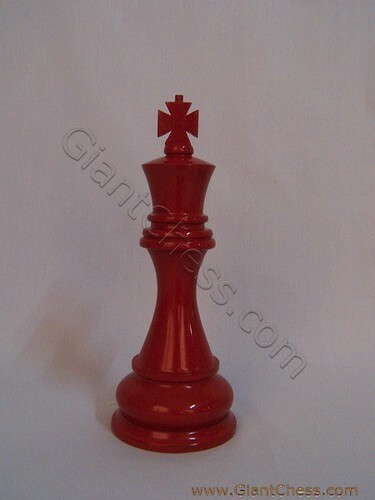 You can dress your living room or your children room with one of color chess piece. It will be interesting if you put the giant chess one that paint in your favorite color and lay it in your living room, dinning room, library, office, party furniture and many more. It also perfect for outdoor decoration such as in patio area, garden, backyard and others. The color chess has made from Teak wood and carved by expert craftsman. So that the product is very durable for any seasons and weathers. Have it now!